The 1978 Alma-Ata Declaration defined the ‘Health for All by the Year 2000’ strategy. Its call for inclusiveness was underpinned by a commitment to the right to health, driven by the World Health Organization (WHO) and its then Director-General Halfdan Mahler (left). The declaration focused on the most vulnerable among us, our children. It advocated an approach to primary health founded in the right to health for all. Alma-Ata signalled a revival of the rights-based approach to health that had been initiated by WHO back in 1948 when it led the drafting of the human right to health in the Universal Declaration of Human Rights. Again this 1948 process was driven by the then Director-General, G. Brock Chisholm (below). This expression of the right to health recognised the right of each individual to access adequate health care. It put the ability to claim this right in the hands of citizens and it was the driving force behind the Alma-Ata declaration’s call for health for all. Unfortunately, neither the 1948 nor the 1978 declaration was followed up with an institutional commitment to human rights. A significant reason for this lacuna was likely the personalities leading WHO and the organization’s decision to shy away from political action. In 2018, WHO is marking the 40th anniversary of the Alma-Ata Declaration with another conference to be held in Almaty, Kazakhstan. Once again health experts will gather to reconfirm our global commitment to health for all. This time the international community will be coming together after having agreed to the right to health for all in numerous international treaties ratified by states in both regional and international contexts. Moreover, the majority of states recognise the right to health in the constitutions or other domestic laws. In other words, the foundation for the right to health is much more sturdy than it was in 1978. Alma-Ata’s call for ‘health for all’, based on a human rights approach to health, remains a viable, valuable, and transformative vision for health care. It is a vision to which we are closer because the international instruments that reflect the right to health are now even more entrenched. No major country in the world has failed to adopt an instrument calling for the right to health. Nevertheless, some of the obstacles to achieving health for all through a human rights-based approach continue to persist. WHO, which is crucial to leading the health for all efforts, is, I argue, especially susceptible to two of these obstacles. First, similar to the aftermath of the 1948 and 1978 events described above, there is question of adequate leadership. WHO requires leadership that is grounded in human rights, and the right to health. 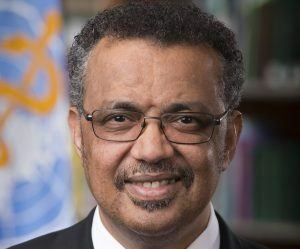 Therefore, I believe that it would behoove Director-General Dr. Tedros Adhanom Ghebreyesus (below) to address the documented human rights abuses of the Ethiopian government during the past two decades when he served as its Minister of Health, Minister of Foreign Affairs, and Presidential Advisor. Second, as is demonstrated by WHO’s upcoming commemoration of Alma-Ata at 40, the message of ‘health for all’ is being diluted by more general messages. Primary among competing messages is Universal Health Coverage (UHC). Although UHC is by no means incompatible with health for all, it is not the same. In the United States, for example, an effort was made to accomplish ‘health for at least more’ people by catering to insurance companies more than to the needs of ordinary people. Similarly, when WHO spokespeople discuss UHC, it is not framed as the right of people to health care, instead they speak about goals which are as unclear as their source. While UHC does not have a clear philosophical driver, a human rights approach does. The Alma-Ata Declaration thus provides an unambiguous anchor in the emerging legal obligations of states, for which they can be held accountable. Today, human rights, including the right to health, are much more entrenched than they were 40 years ago, which means it is entirely appropriate that a rights-based approach should drive UHC. It is perhaps for this reason that that Director-General Mahler relied on the right to health as the foundation of the Alma Ata commitment to health for all. It will be a lost opportunity if WHO ignores the right to health as the framing for the October 2018 commemorative conference. For the spirit of Alma-Ata to survive and strive for another 40 years, the leadership of WHO is vital. The Director-General must not just talk about human rights and the right to health; unless WHO can ‘walk the talk’ its commemoration of Alma-Ata may turn out to be the swan song for ‘health for all’. The consequence of this would be more generations of women, children, and others who will remain without access to the primary care they need and to which they have a fundamental human right. B. M. Meier, The World Health Organization, Human Rights, and the Failure to Achieve Health for All, in “Global Health and Human Rights” 2010, eds: John Harrington & Maria Stuttaford, Routledge, New York. Alicia Ely Yamin, “The Right to Health Under International Law and Its Relevance to the United States”, Journal of Public Health, 2005, 95 (7) pp. 1156–1161. US Department of State, Human Right Report 2016, available at https://www.state.gov/documents/organization/277243.pdf; The African Commission on Human and Peoples’ Rights, Resolution ACHPR/Res. 356(LIX) 2016 on 4 November 2016, available at: htttp://www.refworld.org/docid/5836c5884.html; Amnesty International, “Ethiopia: Dozens killed as police use excessive force against peaceful protesters” (8 August 2016) available at: http://www.refworld.org/docid/57a8aa9a4.html; Amnesty International, Ethiopia: “Release protestors, stop crushing political opposition”, 10 December 2014, AFR 25/009/2014, available at: http://www.refworld.org/docid/548feda04.html; Amnesty International, Ethiopia: “Arrest of opposition leader an outrageous assault on freedom of expression”, 1 December 2016, available at: http://www.refworld.org/docid/584039c14.html; Human Rights Watch, Ethiopia: “Year of Brutality, Restrictions”, 12 January 2017, available at: http://www.refworld.org/docid/5878d4364.html.